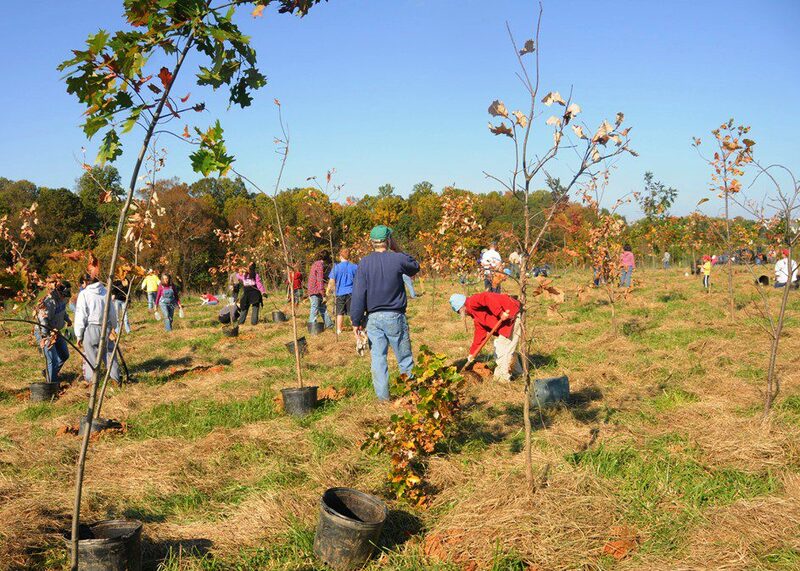 Volunteers carefully plant the 650 native trees during the Middle Run Tree Planting on October 22, 2011. Image by Derek Stoner. 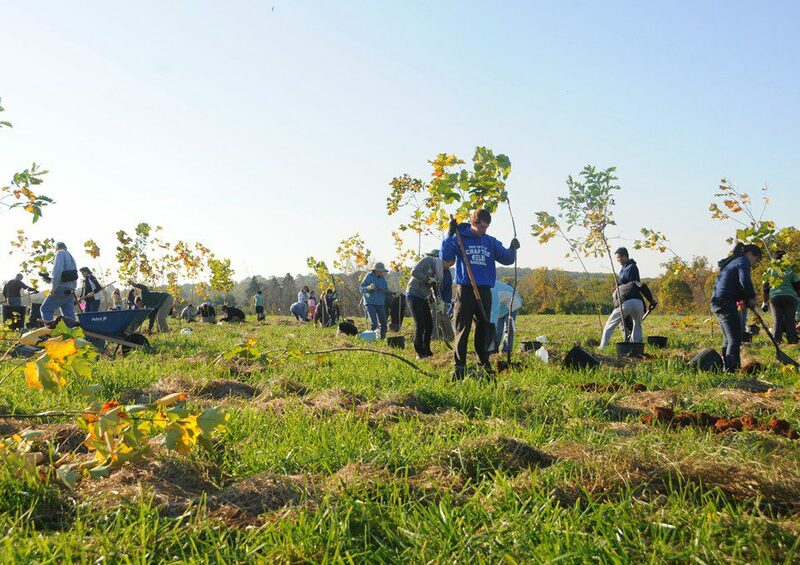 A glorious autumn day greeted the hundred volunteers who came out on October 22 to lend a hand with the Middle Run Fall Tree Planting. 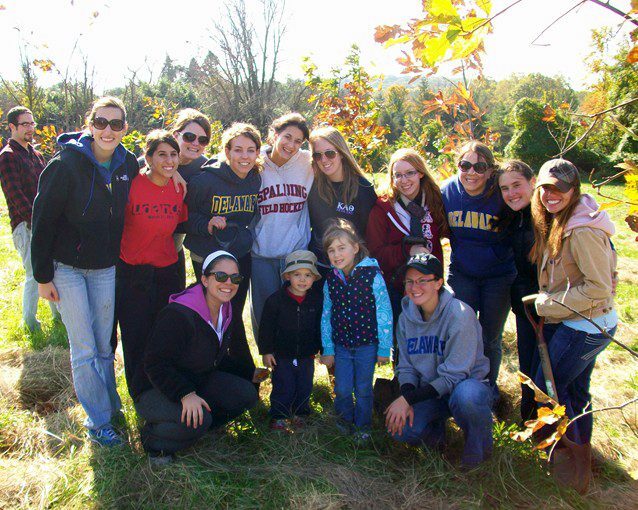 This volunteer corps came ready with shovels in gloved hands, and in short order, helped to plant 650 native trees. Red Oaks, White Oaks, Chestnut Oaks, Sycamore, and Tulip Trees went into the ground, and were carefully planted by the well-trained crew. Planting sizable young trees - 8 to 12 feet - quickly creates a young forest. Image by Derek Stoner. These great trees are grown by Clear Ridge Nursery in Maryland, and this fall they supplied us with super sizable specimens in the 8 to 12 foot range. Still holding their colorful fall foliage, these trees provided instant shade to our volunteers on a warm and sunny day! While in the planting field, we saw plenty of wildlife taking advantage of the great habitat: Eastern Bluebirds, Red-tailed Hawks, Wood Ducks, Common Buckeyes, and even a surprising Wilson’s Snipe that flew over! Smiling, happy faces of volunteers after finishing up a fantastic volunteer tree planting project! Image by Christy Belardo. Our volunteers come from all over: university students, boy scouts and girl scouts, church groups, high school service clubs, and individuals from the local community. All are part of the incredible team of volunteers that the Delaware Nature Society counts on to provide the high quality of programming and events that we are known for in the community. A big THANK YOU to everyone who contributes time to DNS throughout the year! This Wednesday afternoon , November 9, from 2:00pm to 5:30pm, you are invited to join fellow Delaware Nature Society volunteers for a special tree planting along the Middle Run Birding Trail. We will plant 300 native shrubs to provide food and habitat for wildlife. Come to the Tri-State Bird Rescue parking lot (110 Possum Hollow Road, Newark, DE 19711) anytime between 2:00 and 5:00pm to join us for this project. Follow the signs for the tree planting. Contact Derek Stoner (302-893-8426) for further information.